Check Out Our Fun New Free Game! Pilot to Aircraft Operations Center (AOC) or AOC to Pilot. Medical staff to patient or patient to medical staff. 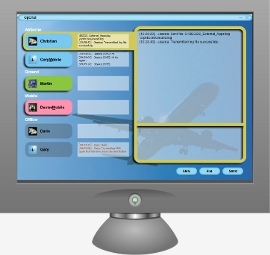 OpChat's easy to use interface allows multiple chat sessions to occur simultanenously. OpChat messaging is handled by our customizable middleware application, OpMessaging. OpMessaging routes OpChat's messages securely, quickly and to a variety of hard to reach remote locations. OpMessaging can be configured to route message over Satellite, Radio, 802.11 Access point, or cell phone network.